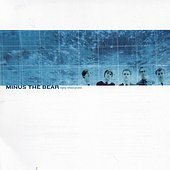 Minus The Bear's debut full-length, Highly Refined Pirates is led by finger-tapped riffs, which compliments their angular rock sound nicely. With some of the most long-winded song titles ("Thanks for the Killer Game of Crisco Twister", "Absinthe Party at the Fly Honey Warehouse", and "Damn Bugs Whacked Him, Johnny", Seattle's latest indie-rock threat is ready to catch you off guard with their serious, potent style of rock that boosts some of the most laughable song titles. And though the songs themselves sometimes mirror the song titles, coming off long-winded and over indulgent, they still know how to structure their songs to grab you, so you will soon find yourself annoyingly or happily addicted. I'll give it a B-.